Energy costs are rising. And given our growing preference for brighter homes, Canadians are now paying more attention to their window and door purchases than ever before. And whether you need new windows and doors for a new home you are building, for a new sunny addition you are adding to your home, or you have decided to join the fight against high energy costs by replacing your existing windows, Lumen Windows and Doors in Ottawa can help. Our windows and doors are Energy Star approved, carry the Energy Star designation, and well exceed the most rigid government standards. Lumen offers affordable pricing, experienced and knowledgeable sales staff, and excellent financing options, including no payments or interest for 6 months. Our professional installation crews are carefully selected and form the core of our organization. Each crew must adhere to a strict set of company-approved guidelines covering "Best Practices". We offer three basic types of windows: PVC, wood frame with aluminum cladding, and fiberglass. Energy efficient frames, clean sleek lines, and low maintenance make PVC windows the window of choice for many homeowners. Lumen's PVC windows are manufactured by Lifestyle in Ajax Ontario. Lifestyle, unlike many competitors which rely on less expensive and inferior off-shore materials, uses only North American parts in manufacturing its windows. Lifestyle windows feature steel reinforced frames for strength and rigidity, enhanced R-values, improved shading coefficients, Poly Thermal foam injected into their frames, and North American made premium hardware. Wood frame windows offer an attractive and elegant charm that can be hard to resist, in spite of a slightly higher cost. The exterior aluminum frames are available in basically any color. 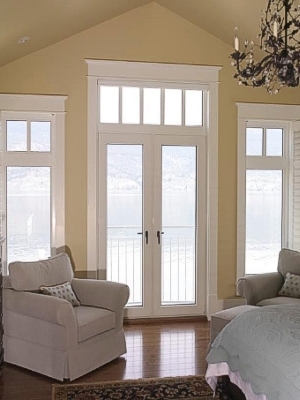 Lumen offers wood frame windows from Bastille Windows and Doors, an established manufacturer that has been supplying the Quebec market with superior products since 1935. Fiberglass windows have two very significant advantages: First, fiberglass frames offer enhanced energy efficiency. Secondly, unlike PVC frames which can only be painted a range of colors on the exterior, fiberglass frames can be painted on both the exterior and interior. Lumen's fiberglass windows are manufactured by Inline Windows and Doors in Toronto. All Lumen windows are available with dual glaze low E and Low E argon with an R-value of approximately 5. Lumen also offers triple glaze glass, which increases the R-value to 10. For information on the advantages of Lumen/Lifestyle glass, and how it can help to improve the comfort of your home, please click here. For information on the many special features that set Lumen/Lifestyle windows apart from the competition, and places us above the industry standard, please click here. For information on the various window styles available from Lumen Windows and Doors, please click here.